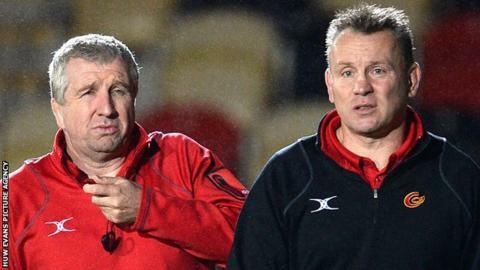 Newport Gwent Dragons head coach Kingsley Jones says he is not sure when director of rugby Lyn Jones will return to work from illness. Jones missed Saturday's 23-21 European Challenge Cup victory at Gloucester. He is expected to be absent again for Sunday's Pro12 match at Cardiff Blues. "He's ill. I've spoken with him yesterday and he said he'd lost four kilograms in weight, the lightest he's been for a few years, and I have to take that as his word," Jones said. "Lyn's a good friend of mine and I've spoken with him three or four times in the last four or five days. I've got an email from him apologising that he won't be in work because he's ill."
Lyn Jones attended Harlequins training last Thursday, sparking suggestions the former Ospreys coach could be in the running to join the English Premiership outfit next season. "Tittle tattle from elsewhere is horrendous. It's ridiculous and I just tend to switch off from it," said Kingsley Jones. "If he was in Harlequins on Thursday, you'll have to take it up with Lyn. "If he's got the Harlequins job, he's kept that from me I can tell you that now. I know nothing about that at all." Kingsley Jones took charge of the win over Gloucester and is again set to take the reins against Blues at the Arms Park. "I've spoken with him about team selection going forward with three big games coming up," Jones added. "I was hoping he'd be back before the Blues game but I don't know."